My use scenario of calendar is as below. Based on my testing, until iOS 7.1, even you have set Gmail account in Setting and synchronize Google calendar with iPhone or iPad. You just synchronize those calendar which created by self. All Google calendar shared by another user won't display on iOS calendar. It means that iOS calendar couldn't meet our requirement. Sunrise has several great features as below. It is not only avoid unnecessary trouble to re-enter calendar, but you also could join the Facebook event on Sunrise directly. You could input the necessary information, the location and the mail of the people. Thus you could send a mail to people to check attend or not. And it'll guide you to a dating site. The screen is divided into two parts: upper part and lower part. Click the date on the upper part, the lower part will display the detailed dating in this day. It will save lots of time to switch screen between calendar and dating. 直接顯示今明兩天的天氣 It could display the weather for today and tomorrow. The Google calendar could only shared with the Google account users. If you are using yahoo or hotmail, you can never use shared Google calendar. Make sure that you had been added in the shared list of Google calendar. And you will receive an notice email in your Gmail. In this case we use "Test" calendar. Please click this link to install Sunrise. You must accept that Sunrise use your contact and calendar. Set "Background Refresh" to "15 minutes". 等待約15分鐘 Wait for about 15 minutes. Google calendar will be synchronized with iPhone for a while. Those shared Google calendar should be displayed in the list. After enable certain calendar, you will use it on Sunrise. Only those calendar which has been enabled in "Visible Calendars" will be displayed over here. If you would like calendar alarm you, please enable it. 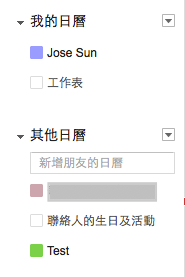 Q1: 要怎麼確認我已經被加入別人分享的Google 行事曆內？ How do I confirm that I have been added in the shared list of Google calendar? If you have been added in the shared list of Google calendar, you'll see the shared calendar in the "Other calendar".